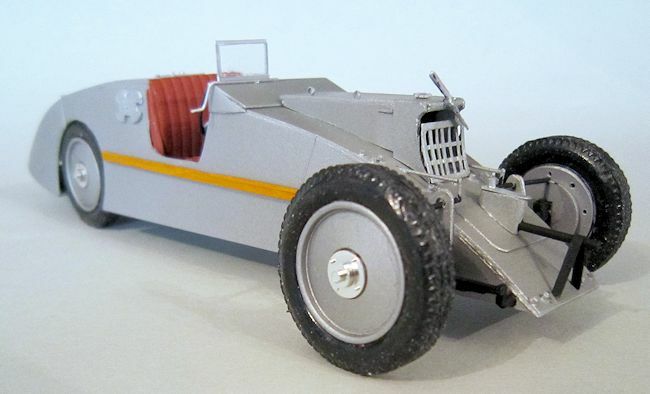 NOTES: A donor kit of the Heller 1/24 Citroen B-14 Torpedo de Luxe, kit number 80732, was used. After WWI Gabriel Voisin abandoned his pioneering aviation work, citing the trauma of the military use of his aircraft during the war. From then until 1958, he concentrated his efforts on making cars. His early production cars were some of the finest luxury vehicles in the world, with unique technical details. In 1922, by liberal interpretation of the rules, (a French phrase meaning “cheating”) Voisin won the Grand Prix of Lyon. The organisers were unhappy with the result and banned the car design for the following year. In response, Voisin evolved an entirely new concept, the C6. It is always difficult to obtain the same horsepower from a sleeve valve engine compared to one with conventional valves. In addition, Voisin did not have an engine of the required two litres. He therefore asked André Lefèbvre to design a light car with good aerodynamics which would compensate for the lower power of Voisin engines. This is how the Laboratoire was conceived in 1923 and was the first race car which tried to obtain stability using aerodynamics and also the first monocoque car. There is two easy ways to know that Lefebvre was a designer of genius. He went on to design the Citroen Traction Avant, or Light 15 as it was known in the UK. It had monocoque construction too, a long wheel base, front wheel drive, and was the getaway car of choice for some bank robbers who became known as the Traction Avant gang. It was also used by the villain Le Chifre in Ian Fleming's first James Bond book, Casino Royale, and Bond finds himself envying Le Chifre's car as he pursues it in his 1930 Bentley. Then, as if that were not enough, Lefebvre went on to design the Citroen DS, another long wheel base, front wheel drive car of astonishing shark-like beauty. You can see the genesis of both those models in his 1923 Voisin, which used light alloy monocoque construction, with aerodynamic body and two rear wheels set close together, with no differential on the rear axle to save weight. This would have led to cornering problems, with severe tire scrub, and one wonders why he didn't go the whole hog, and have one wide rear wheel, with front wheel drive. The latter feature would have proved problematic on a cart-sprung front axle however, and would have meant steering difficulties caused by axle tramp under power. Still, you can see which way he was leaning. 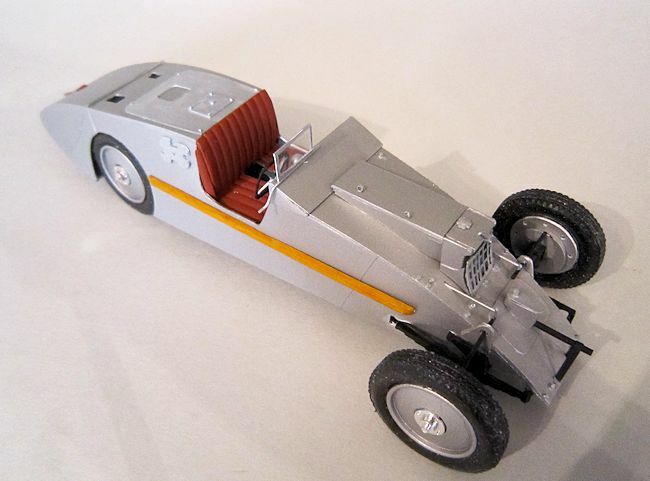 The model came about after I bought the Heller Citroen B14 second hand at an air show at Duxford airfield, near Cambridge. I wasn't aware of the kit until I saw it, and at £7 it seemed like a snip. Alas, it didn't work out, thanks to my cat, who despite being a old lady of about 105 cat years, is still a t ough old grannie. She suspected it was an interloper on her turf. The resulting brawl was 1-0 in favour of the cat. It seemed a shame to consign those elegant disc wheels to the Big Bag of Wheels in the spares box, and so I cast around for something I could scratch build to use up them and all the other bits and pieces. I did look long and hard at the Marmon Wasp, the very first winner of the Indianapolis 500, but the wheels on that were far larger and thinner. Still, that project is on the back burner for when I can find some suitable wheels for it. I suspect a larger scale Model T ford might be the answer. 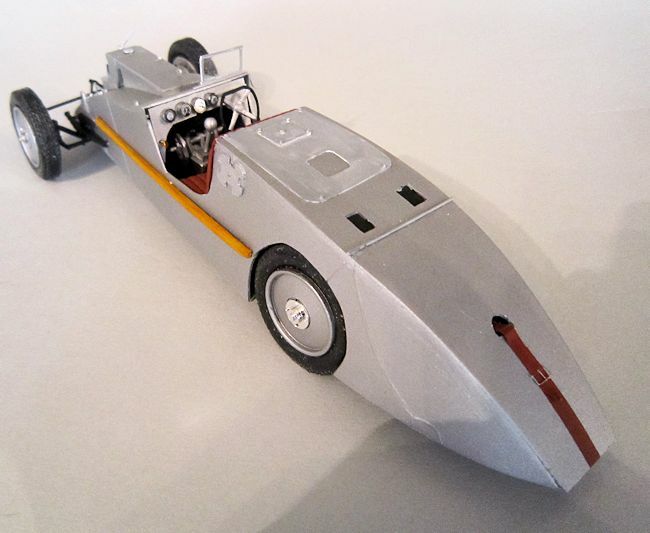 After much internet surfing, I found scale plans of the Voisin Laboratoire, a car I was dimly aware of because the aero-engineering connection with Voisin aircraft. It appealed because the body is basically flat planes, without compound curves, and so can be assembled from plan. It is the simplest form of scratch building and should present no problems for someone starting out for the first time. Simply cut the base and body sides from the plan, glue them together and you already have a sound basis before continuing. It is best to leave the top panels until after you have done some detailing in the cockpit. This has to be boxed off, and it is best to introduce spacers between the sides. The Citroen's bench seat was hacked about until it fitted, with space for the transmission tunnel, which also came from the Citroen. The gear box hump was built up from scrap. There is a curious set of levers in front of the gear change, which is basically a horizontal rod, with actuator lobes threaded on it, rather like an oversized camshaft. I cannot quite make out what it does, but must be some sort of gear linkage. Some photos show it painted in an odd pale metallic green, which I didn't attempt. The gear change came from the Citroen, as did the steering wheel, cut down and reshaped to its square form. Instruments of the panel are off cuts from sprue, with some dial decals on them. One of them is a clock, and I imagine it was a Breguet, for the mechanic to calculate race times. The rear axle was cut down from the Citroen, and embedded on the base. Then the front axle, and track rod, again from the Citroen, was cut down and reshaped, and glued in place on its cart springs which had been flattened. Attention now turned to the front end and this is a lot of fiddly work with rod, and scraps of plastic to replicate the springs, shock absorbers, starting handle tube and mount, steering arm, and also the brake rods, which emerge in front of the radiator and actuate the brakes by means of cunning narrow levers. It is easier to look at the plans than describe. The Citroen's radiator was cut down and embedded inside the box-like bonnet (“hood” to you in the US). And then a grille built up from narrow strip. The radiator header tank was carved from thick plastic. Photos show that the car's panels were covered in large rivets, and the largest of these were cut from plastic rod. A test of one's eyesight and steadiness of hand. I believe that railway modellers use strips of ready made rivets. And even that there are 3-D decals for them too (There are; Archer makes them. Ed). This would certainly make life easier if you can find some. The two front wheels need backing plates, from sheet plastic, which were drilled around the circumference for lightness. The front wheels can be glued onto the brake drums from the Citroen. More by luck than judgement the car sat four square on its wheels, without any embarrassing tire lift. For some reason, the vinyl tires attract dust and assorted rubbish from all over the place. I suspect that they secretly harbour static electricity. No amount of scrubbing and scraping makes any difference, and I half expect to find them covered in tumbleweed one morning. Not that London has tumbleweed. Finally, all sorts of fiddly extra panels were added, including those strange rounded-oblong-with-bites-out-of-the-four-edges things behind the cockpit, which hide the filler caps for the fuel tank. Mask off the cockpit and blast the whole thing with aluminium paint. The one dash of chrome I allowed myself were the hub caps, which is probably not accurate, but I work on the principal that the whole point of a car is to carry chrome. There are two wooden strips alongside the cockpit, which look like vestigial running boards, but were probably to stiffen the body. A couple of strips of plastic card were painted mid-brown, and given a coat of Tamiya Clear Orange. A strap for the rear panel, which covers the spare wheel, was fashioned out of Tamiya masking tape, and a thin wire buckle. The aero-screen was cut from clear plastic sheet, framed by thin strips of card and glued to its rotating rod mount, with the small handle at the side for the driver to raise or lower it with his right hand. Finally, the propeller, a neat little nod to its aeronautic Voisin forbears. It isn't there for show, and in fact drove the oil pump, though presumably not when it was most needed, at start-up, when the car would be stationary. Again I used the fan from the Citroen suitably cut down and sanded. Formidable. 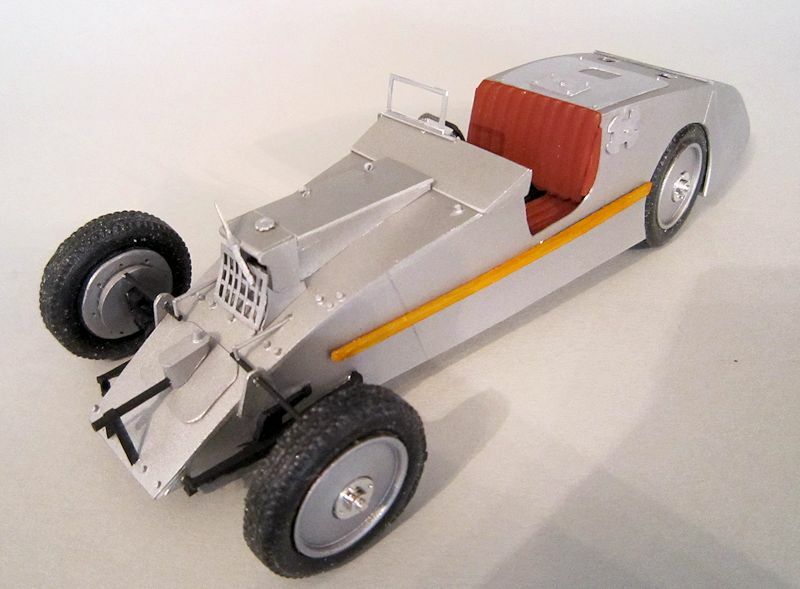 This was the first car I had made for about 40 years, and certainly my first scratch built one. I don't have a large spares box of auto parts, and so was lucky that so much of the Citroen was useable. The beast has a certain je ne sais quoi about it. There is still one in existence and often has an outing at Goodwood, the famous race track, outside London. You can find a picture of it on one of the sites below, with the driver and mechanic sporting Flash Gordon winged helmets, which seems appropriate to its art deco appearance. The whole thing looks like Le Corbusier has got at a car.